Enough of the so-called bestselling novels and fiction books that not only promote witchcraft, blasphemy, murders and violence, but also justify them.These so-called secular bestselling authors prey on curious and adventurous (often,very young and brilliant)minds that crave for something new and maybe worse or more violent tendencies.They (consciously or otherwise) condition our minds to accept their labour, as a mirror of the reality in our current society. What is also worse is that they were able now to attract the youngest following, with the book and film series on witchcraft, catering to young people and disguised as harmless and innocent plot(ploy is a better word) filled with new and high-tech animations etc. But this book or film trend is more of a subtle but deliberate maneuvering of the thoughtlife of the individual, and the society, consequently. If you are a bookworm, and if you had a choice (and you do) would you invest on books that cater to negativity that confuse,weaken and destroy your mind's creative and positive potentials, or would you rather feed on books that teach you how to literally reign in life,based on infallible biblical principles? It is not an easy choice, especially because we live in an environment that is morally indifferent and tolerant. It is true, you are what you think. But if your thinking is polluted by secular standards (and not,biblical) it is unlikely that you're destined to reign in this life. 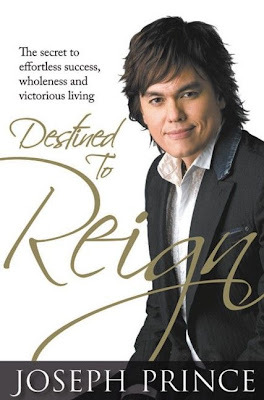 Highly recommended reading for young (especially) and old alike, 'Destined To Reign' by Pastor Joseph Prince.